Unfortunately, one way to assess the political importance of blogging around the world is through the growing number of blogger arrests. 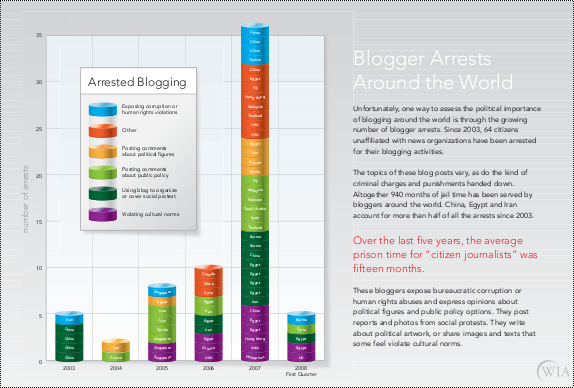 Since 2003, 64 citizens unaffiliated with news organizations have been arrested for their blogging activities. For the overwhelming majority of us, writing a blog is a hobby. For a brave few it is a more serious occupation or calling with a higher personal cost. But blogging will continue to grow (look at the WordPress figures for example), affect us (see one view in “Net Libertarianism” in the TLS), and bloggers will keep the pressure on rogue regimes and defend the freedom of expression everywhere. See the full story from the World Information Access Project and download the 2008 WIA Report here.